Need a quick way to decorate your home for the holidays? If you have leftover wrapping paper and a few frames, you can put together fun Christmas decorations to set around your home. 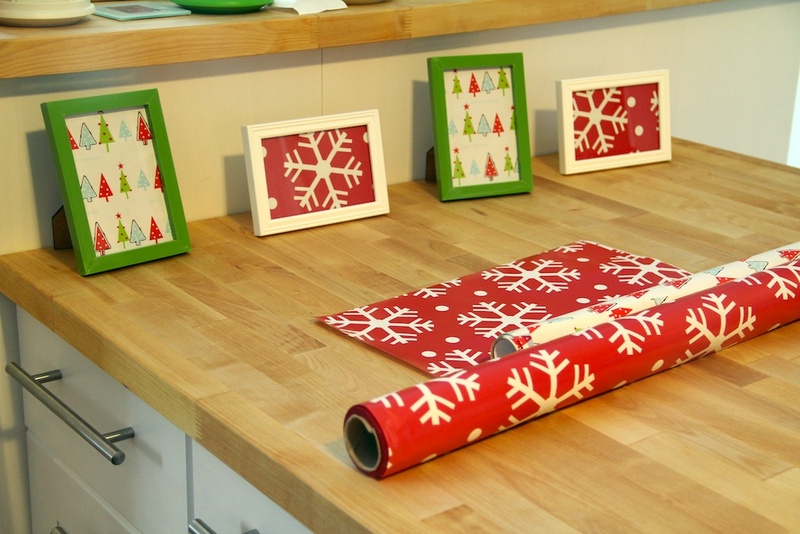 Remember the wrapping paper frames that are sitting on our kitchen island? 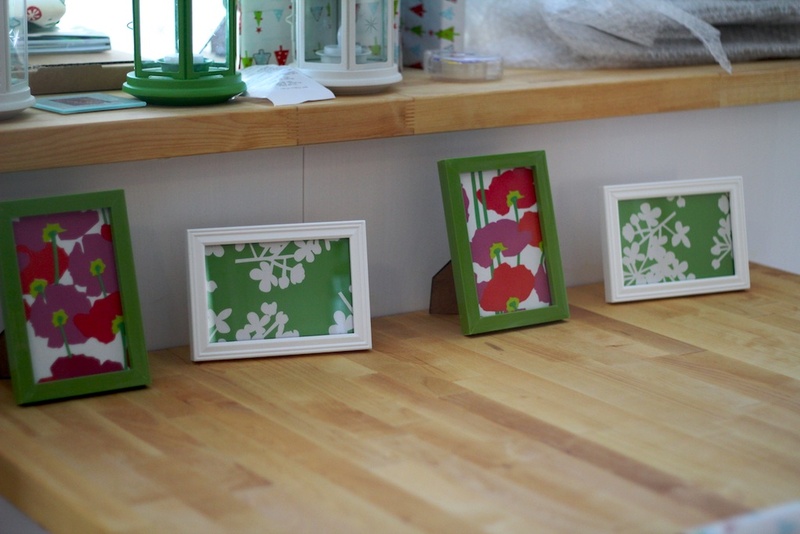 With a quick change of the wrapping paper, we have Christmas frames sitting on our island. You can change the paper throughout the year for different holiday decorations. If you receive a gift wrapped in beautiful paper and you can’t bring yourself to throw it away, why not use it in a picture frame?These frames are great to put in bathrooms and guests rooms. They are a nice holiday touch without taking the time to decorate every room in your house. I love this project because it took me around 15 minutes this morning to switch out the wrapping paper in the frames. If you would like to read more about my wrapping paper frame project, visit my earlier blog post here. 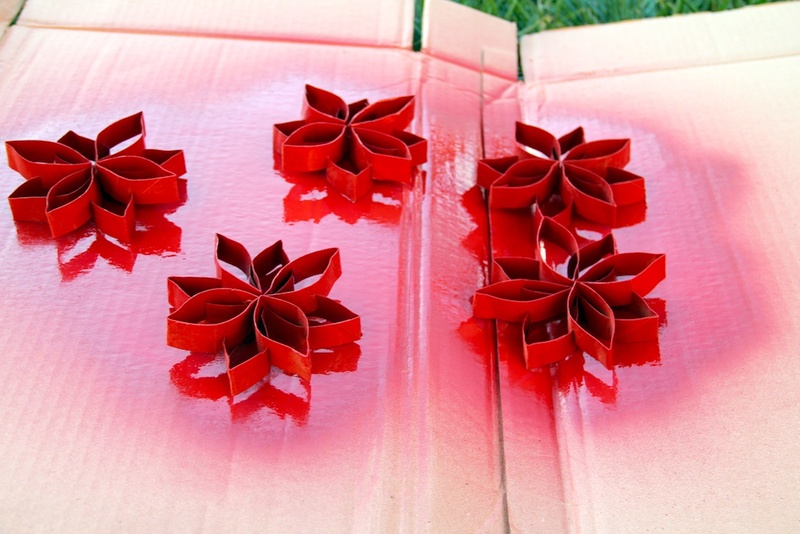 And if you’re looking for a few inexpensive Christmas ornaments, you can make Christmas poinsettia ornaments. First, cut a paper towel or toilet paper roll into 3/4 inch strips. Next, take each strip and use your fingers to pinch the ends. 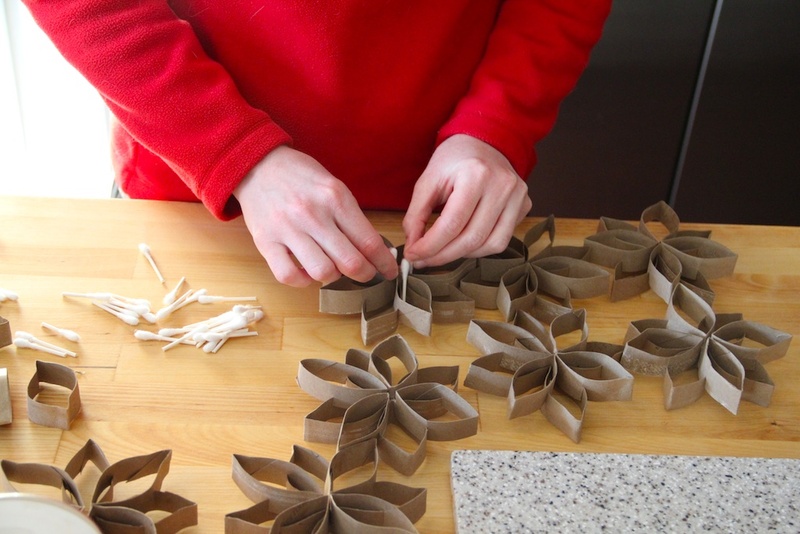 Holding each end, push toward the center of the strip to create the poinsettia petals. If not, they will look more like daisies as seen above. There should be four petals on the bottom and four on the top. If you would like to add the centers to the poinsettia, you can use Q-tips cut in half, or you can leave the flowers as is. 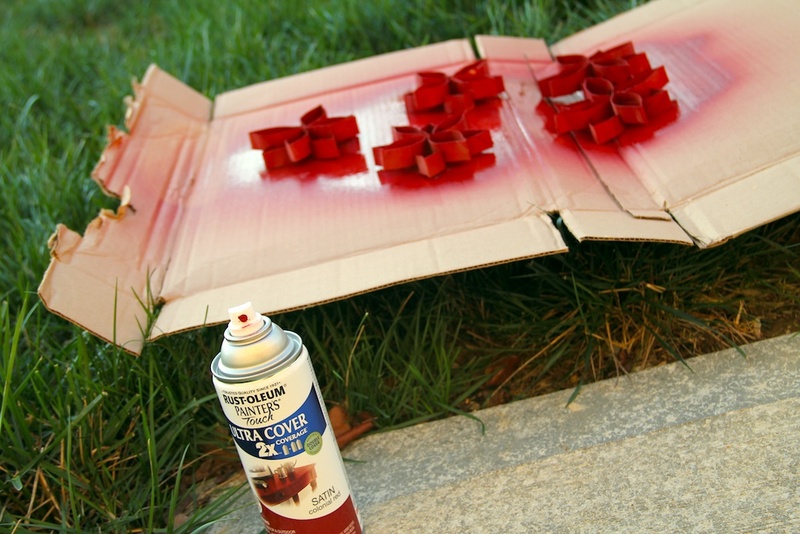 Finally, spray paint your flowers in your choice of color. I chose a deep red because I love red poinsettia. Once your poinsettia are dry, you can hang them on your tree with string! I used the flowers above to make a recycled wreath for an office competition. 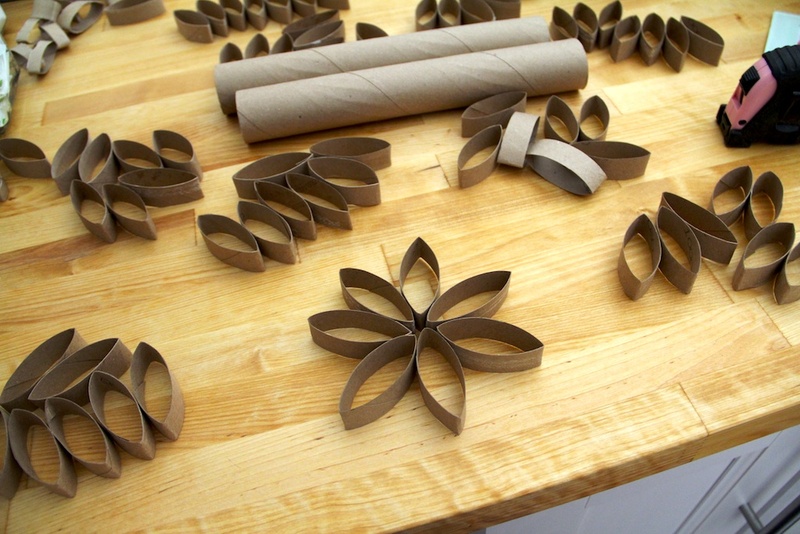 It’s a great way to repurpose paper towel rolls. This entry was posted in Decorating with Color, DIY, Paint and tagged Christmas, DIY, Frames, Going Green, Green, Home Decor, Home Decorating by Frame by Frame Style. Bookmark the permalink.